The first version of the Busicom Junior illustrated here is actually badged for sale by the National Cash Register Company (NCR) as the NCR 18-15, and uses 22 integrated circuits. The second version of the Busicom Junior illustrated here is again badged for sale by the National Cash Register Company, this time as the NCR 18-16. This was the first calculator to use a single "calculator-on-a-chip" integrated circuit. The use of the single chip allows this model to be slightly smaller. A small, desktop electronic calculator using 22 integrated circuits. Display - 12 digits, separate green vacuum-fluorescent tubes. 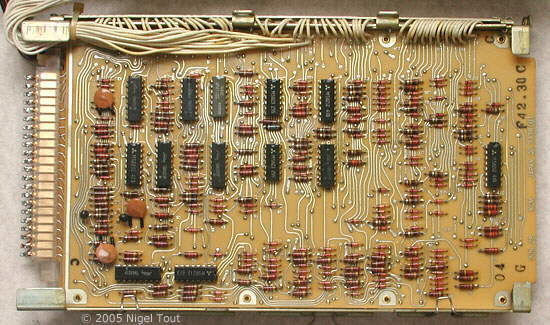 Technology - Uses 22 integrated circuits, from Mitsubishi, Toshiba, and NEC (here date-coded 1970) and 260 diodes. Size - 160 x 275 x 97 mm (6.25" x 11" x 3.8") - this is slightly larger than the later NCR 18-16, below. Made in Japan by Busicom Corporation for NCR (National Cash Register). Price of the Busicom Junior version of this model calculator, in UK in 1971, £168 GBP (about US$400). 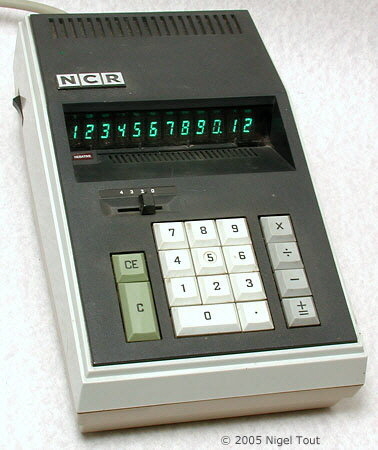 The NCR 18-15 is the immediate predecessor of the NCR 18-16, below. Although looking roughly the same, the NCR 18-15 is actually 12mm (0.5") thicker to accomodate the three circuit boards against the single board of the NCR 18-16. Inside the NCR 18-15, with, on the right, the two large circuit boards and the small display boards. 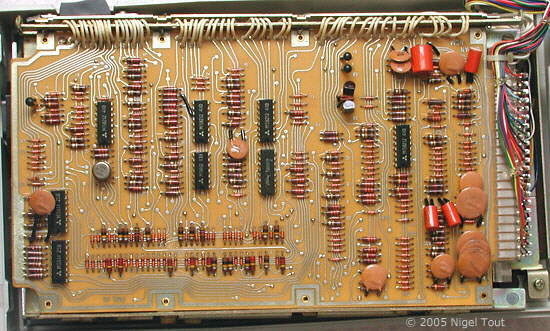 The upper circuit board of the NCR 18-15. The lower circuit board of the NCR 18-15. The first time that all of the electronics of a four-function calculator was squeezed into a single integrated circuit—a "calculator-on-a-chip". 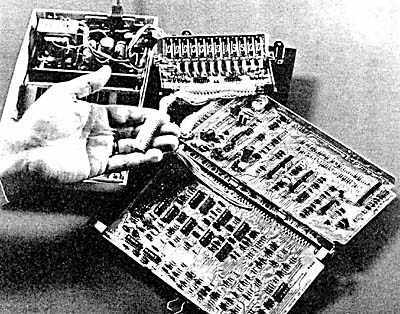 Technology - The first use of a "Calculator on a Chip": the Mostek MK6010 LSI (Large Scale Integration) chip, here date coded 7125 (that is week 25 of 1971). Size & weight - 160 x 275 x 85 mm (6.25" x 11" x 3.5"), 1600 g (3.5 lbs). The NCR 18-16 is a development of the NCR 18-15, at top. Although looking roughly the same, the NCR 18-15 is actually 12mm (0.5") thicker to accomodate the three circuit boards against the single board of the NCR 18-16. 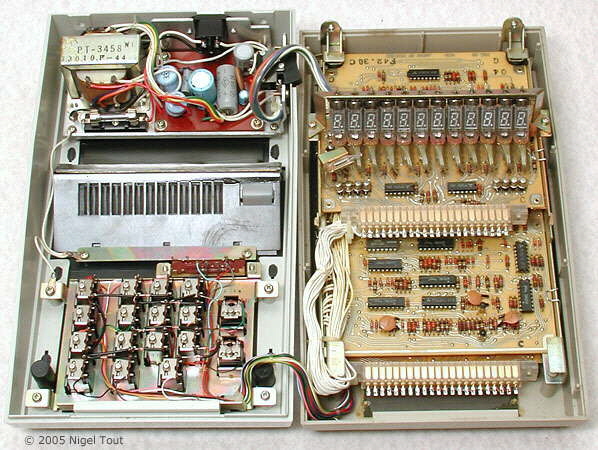 Inside, showing the circuit board with the single Mostek MK6010 "calculator-on-a-chip|". 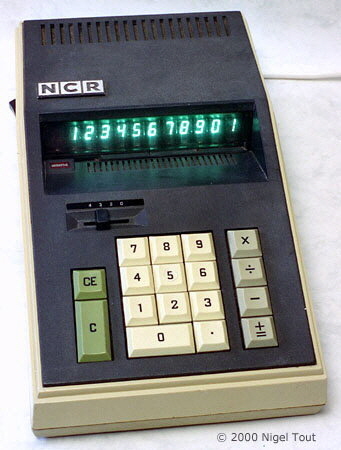 Compare with the earlier model the NCR 18-15, above. Cutting edge technology of 1971, the Mostek MK6010 "calculator on a chip" in a Busicom Junior calculator. The integrated circuit illustrated is date coded 7125 (i.e. 1971, week 25) and is also marked with the 'NCM' logo (Nippon Calculating M achines—the original name of Busicom Corp.). The IC is mounted on a small piece of circuit board which plugs sideways into the black socket. "Mostek produced the first calculator on a chip for Busicom Corp. The 180-mil-square [0.18 inches-square (4.6 mm-square)] chip contains the logic for a four function 12-digit calculator - more than 2,100 transistors in 360 gates plus 160 flip-flops. Busicom's initial use of the chip will be as a direct replacement in its Junior model calculator now being distributed in the U.S. by National Cash Register." The chip held in the hand replaces the two circuit boards full of components, including 22 MSI (Medium Scale Integration) integrated circuits, see article quoted and the NCR 18-15 above. 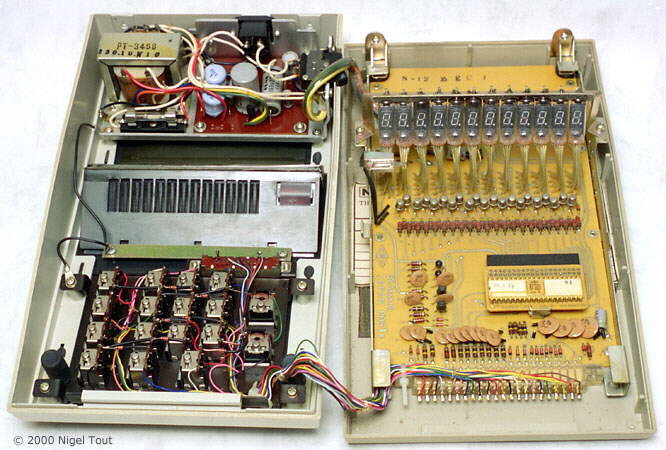 The single chip, using a p-channel process, replaced 22 chips in the previous version of this Busicom Junior calculator, see below, and reduced the number of circuit boards from two to one. Note that separate transistors are still needed as high-voltage display drivers. 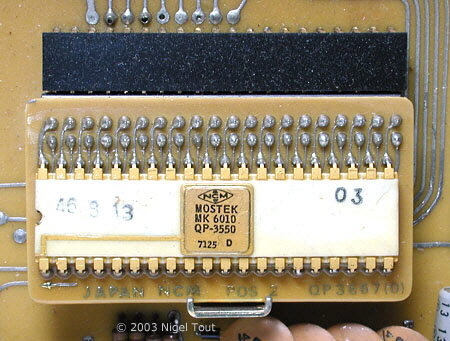 The article continues ... "The original calculator's discrete diode-resistor and IC logic was a very clever design, says Mostek, developed over many years and requiring nearly the minimum logic necessary for a four-function machine. ... the minimised logic contributed greatly to Mostek's success in putting a calculator on a single chip". Mostek of Dallas was then less than 2 years old. See also the article "The Calculator-on-a-Chip" on this site. This was the first use ever of a single chip for all the functions of a calculator, described then as a "Calculator-on-a-Chip". It was the cutting-edge technology of the day . This development was the culmination of the gradually increasing integration during the late 1960s, accompanied by reducing the number of components. Driving the display required higher power transistors which could not be easily integrated with the logic circuits on the chip, but within a couple of years this was achieved and the only electronics required for a simple calculator was the one chip. The calculator could now be much smaller and consumed much less power, leading on to small pocket calculators (eg. the Busicom Handy LE-120). Assembly of calculators was much simpler so low labour costs were not so important in their manufacture, and many calculator manufacturers sprang up in the U.S.A. and Europe. However, a few years later, when the cost of the chip, display, and keyboard had dramatically fallen, the assembly cost again became a large proportion of the total cost and manufacture returned to low labour-cost countries. Calculators from some of these short-lived start-ups are illustrated in the article 'One Hit Wonders'. The development of electronics had now reached the stage at which a truly pocket-sized calculator was possible—the Busicom Handy LE-120. "Office hardware: Calculators—for choice", Management in Action, February, 1971, p50. "Single-chip calculator hits the finish line", Electronics, Feb. 1 1971, pp19-20.